I don't know who Sue Fitzmaurice is but it doesn't really matter. I think what she says is right. I recall when I was at university and for a time the world wasn't looking all that bright. I decided I would finish the day listing three things I was grateful for, even if two of them were that the sun came up and the sky was blue, every single day. It took little more than a week to shift me out of my mood. And as I recall, I was in quite a mood, so that was a fairly quick turn around. 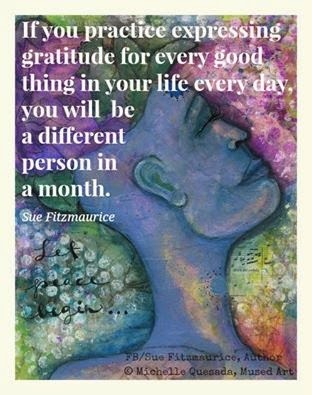 There are lots of ways to express gratitude. Say thank you - spoken words, written words, a hug, a gift, a smile. Return an act of service or pay it forward. Find contentment, even in the small things. Shake off discontentment by searching for the good in the moment.